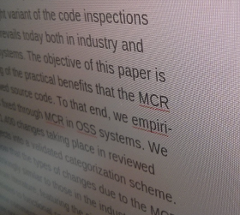 Whenever I wrote a paper, I hated having to reformat my abstract upon submission. Why couldn't I simply copy the abstract from my PDF or LaTeX sources into EasyChair's, CyberChair's, or PeerJ's text field without a lot of manual work, like removing erroneous, hard-to-spot linebreaks and special markup? Thanks to the Abstract Formatter, now you and I can! So, in the past, I had to manually delete all these stupid line breaks. With hy-phe-na-tion in the PDF, things got really ugly. And you overlook a lot of these in the small textbox that EasyChair, CyberChair, and PeerJ provide you with. As it happens, I have no time for these things when I submit a paper. If you feel the same, well, despair no more, because my frustration led to the Abstract Formatter. It not only removes all those unwanted line breaks for you, but it also does some nice sanity checking on your abstract, giving you that comfy feeling of a really tiny tool that just does what it should do. And it can handle TeX code, too. Abstract Formatter will forever stay free to use, redistribute, and modify (under the GPL). If you have a bug or feature request, I'll try my best to implement it. Just drop me a line. Or, create an issue/fork/pull request on GitHub. A few people have already done this, thanks a lot (especially to Thomas Kinnen and Daniel Strüber)! Your formatted abstract from the PDF or LaTeX source! Made with on GitHub by Moritz Beller.